SOUTHINGTON — A local family is temporarily without a home after a fire broke out Monday afternoon at their Marion Avenue house. Firefighters were called to 764 Marion Ave. at about 12:49 p.m. after some passerby called in a fire at the multi-family home. The first responding firefighters encountered smoke being pushed through the shingles to the first floor, second floor and attic of the two-story home, according to Southington Battalion Chief Glenn Dube. The fire was mostly contained to the interior of the home, he said. No one was home when the fire broke out, and no injuries were reported. “One of my biggest concerns was that the house has what’s called balloon framing,” Dube said, adding that this type of construction can contribute to fire spreading rapidly because of its open spaces. He said gusty weather conditions were also a concern. Firefighters, Dube said, “opened up the walls on the first and second floor and stopped it.” He added that the fire was knocked down pretty quickly. It took a total of about half an hour to make sure there were no fire remnants in any of the open spaces in the home’s framing, Dube said. The fire was stopped before it could reach the attic of the home. It caused what Dube described as “moderate damage” to the first and second floor. “The damage you can see on the outside doesn’t do justice to the damage on the inside,” he said. One family from the two-family home is temporarily displaced. One of the units was left in good enough condition for the resident to remain there. 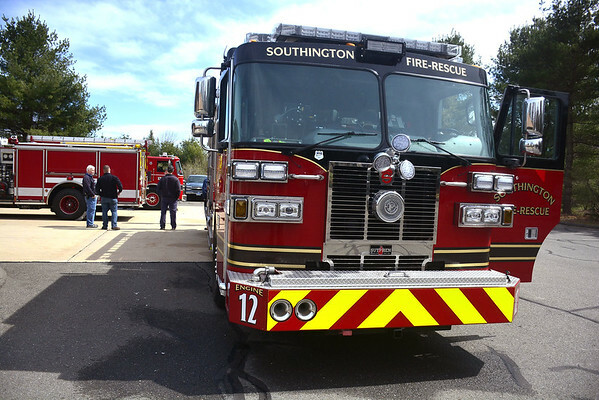 Officials from Southington Community Services were prepared to help the displaced family find temporary housing, but they were able to make arrangements on their own, according to Dube. Mutual aid from Cheshire and Meriden was called in to assist with the fire. Aid from Plainville, Kensington and Wolcott was used to cover the Southington fire houses in the event of another fire. The fire marshal is investigating the cause and origin of the fire. Posted in New Britain Herald, Southington Herald on Monday, 1 April 2019 13:32. Updated: Monday, 1 April 2019 15:17.